The first Palace Theater opened November 3, 1917. That theater was demolished in 1940 and replaced with another Palace Theater which opened June 2, 1940. 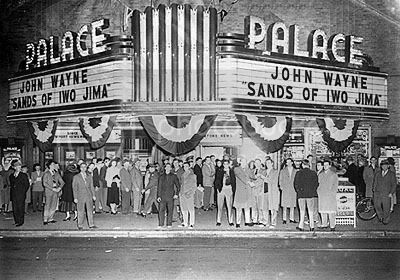 Some people refer to the second theater as the New Palace Theater. It was closed June 6, 1978. The second Palace Theater building still stands today and is now home to the Full Gospel Church of Deliverance. Newport News is one of the saddest victims of that evil curse-“urban renewal”.It once had a vibrant,busy downtown with large dept.stores,theaters and shops.It is a near total wasteland now. As the 2nd picrure shows a lot of downtown,compare to a visit now.Where did it all go?You’d really have to look hard to find a downtown so destroyed.Leave it to the amazing Mr.Memory to show the truth so well. Great shot of the Palace here. Caption says demolished but as we know it is now a Church. I was able to go inside the Palace Theater this week. It is now a church and looks just about like it did in its day. The murals on the walls are gone replaced by paint and Bible verses, the upstairs lobby has been remodeled as well at the rest rooms but other than that it is much the same. They told me that the seats are about 90% original. The screen is gone but the stage is still there. They hold meetings there every Sunday. I am posting a photo of sitting in the lobby last week. The Palace Theatre opened on November 3, 1917. The original building was demolished and rebuilt and opened in 1940. The Palace played its first X movie, “ILSA”, in January 1976. November 3rd, 1917 grand opening ad in the photo section.